Out of print (since FFG lost the Warhammer license). Pristine condition, all cards sleeved. 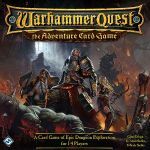 Includes the (also OOP, print-on-demand and harder to find) Warhammer Quest: The Adventure Card Game – Witch Hunter Expansion Pack and Warhammer Quest: The Adventure Card Game – Trollslayer Expansion Pack character expansions.